Jack Hanley Gallery is very pleased to open the fall season with an exhibition of mixed-media works on panel by Bay Area artist, Alicia McCarthy. 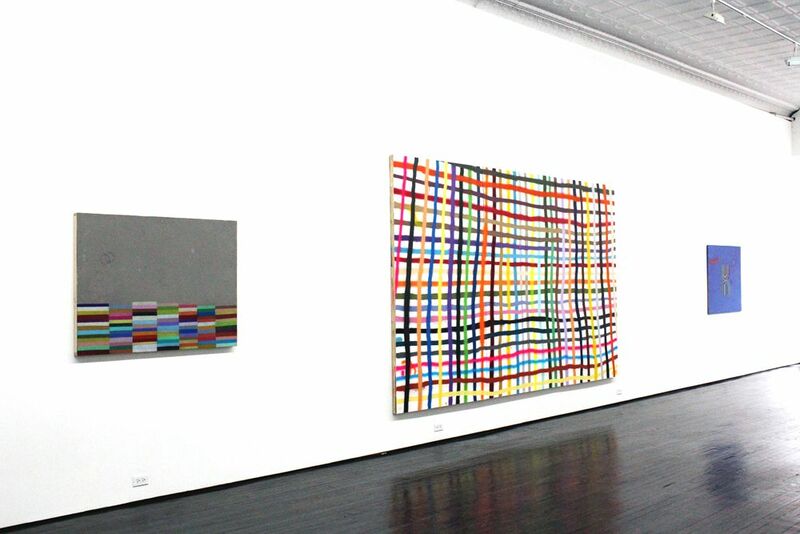 For her sixth solo show with the gallery, the artist has imagined a decidedly reductive and focused exhibition, presenting larger works, an extended color palette and new motifs, while pursuing her well-established vocabulary to new ends. Alicia engages with the immediate world around her. Although visually abstract, the motifs are deeply personal and her works often include an indication of physical presence. These markings can be literal–such as the ring left by a coffee cup, print from a boot or a note written by the artist. 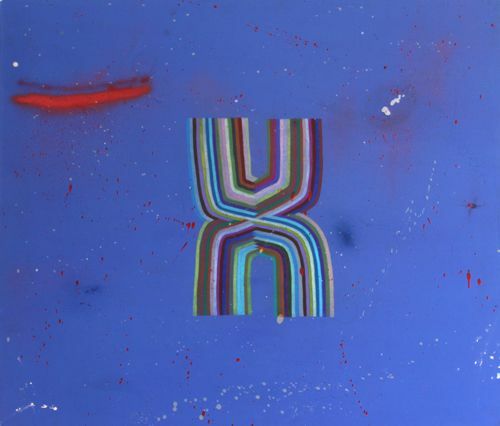 They can also be referential, like the weave and rainbow, two of the more predominant symbols in her work which reference the LGBT community in San Francisco and Oakland. 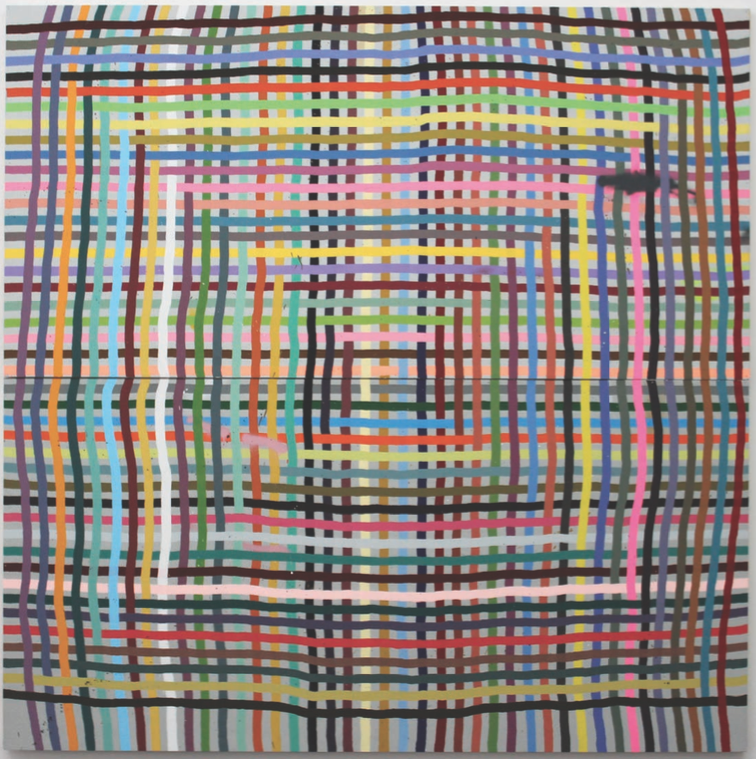 McCarthy’s compositions are frequently complimented by text that alludes to her long history in the street art community and her central role in the Mission School, a group of artists working in the Mission District of San Francisco in the early 1990’s. Coming up in the Bay Area pre-Dot com boom, McCarthy alongside Chris Johanson, Margaret Kilgallen, Ruby Neri, and Barry McGee embody the urban street and graffiti culture with its rustic aesthetic. “There all you.,” is one of the artist’s signature texts. Typical of her practice, the sentence is deceptively naive and vulnerable to multiple outcomes and interpretations, much like the artist’s double rainbow motif. There is often a relatability or familiarness to her subject matter that initially draws the viewer in, but easy readability is always missing. 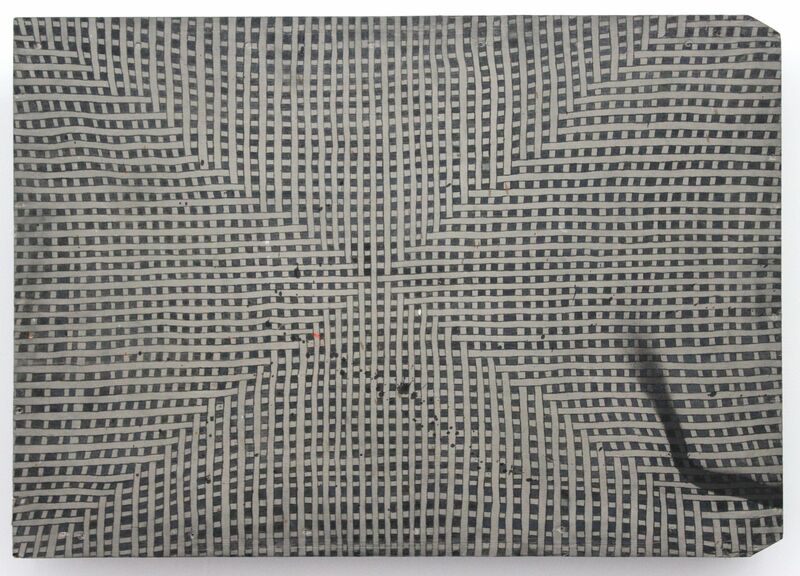 Relating to the idea of entropy, the particularities of Alicia’s practice gradually shift the experience of viewing from an ordered and relatable subject into something much less structured or definitive. Alicia McCarthy (b. 1969) lives and works in Oakland, California. Recent solo and two person exhibitions include Snobody at V1 Gallery in Copenhagen and Alicia McCarthy + Jenny Sharaf at Johansson Projects in Oakland. Last year, the artist participated in Fertile Ground: Art and Community in California at The Oakland Museum of California Art and Pierogi X X: Twentieth Anniversary Exhibition at Pierogi in New York. In 2013, McCarthy exhibited in Energy That Is All Around: Mission School: Chris Johanson, Margaret Kilgallen, Alicia McCarthy, Barry McGee, Ruby Neri at the Water and McBean Galleries, San Francisco Art Institute and at the Grey Art Gallery, New York University. She received her BFA from San Francisco Art Institute in 1994 and her MFA from the University of California at Berkeley in 2007. 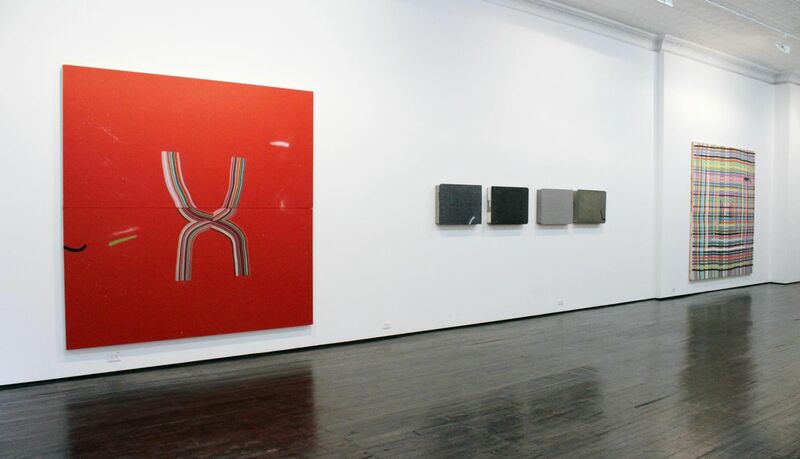 McCarthy has exhibited across America and internationally, and in 2013 she received the Artadia Award for San Francisco. 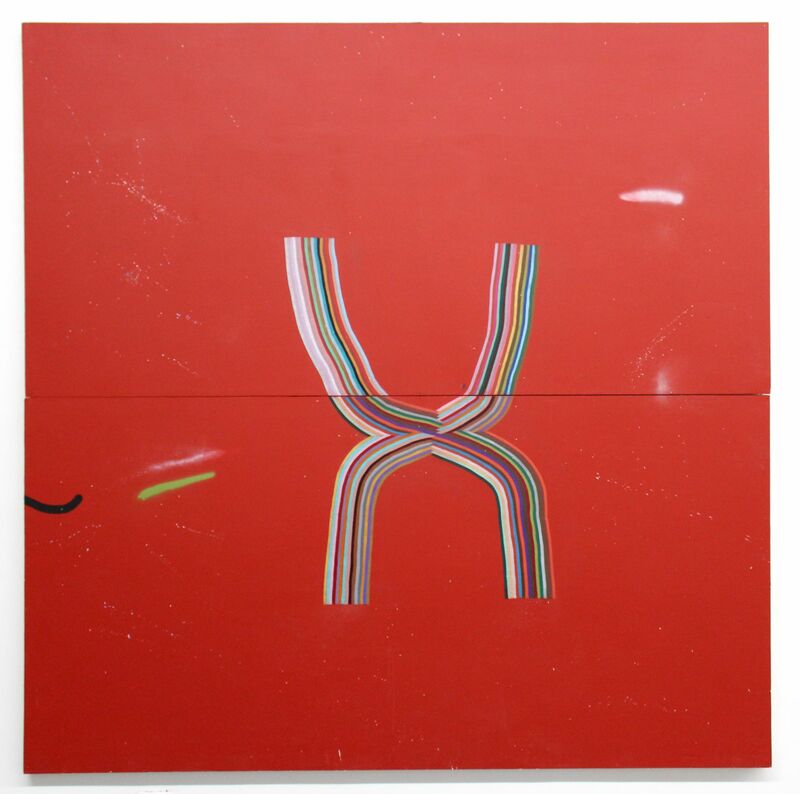 McCarthy has received numerous accolades and residencies, most notably from Skowhegan School of Painting and Sculpture, New York, Headland Arts Center and New Langton Art, San Francisco. 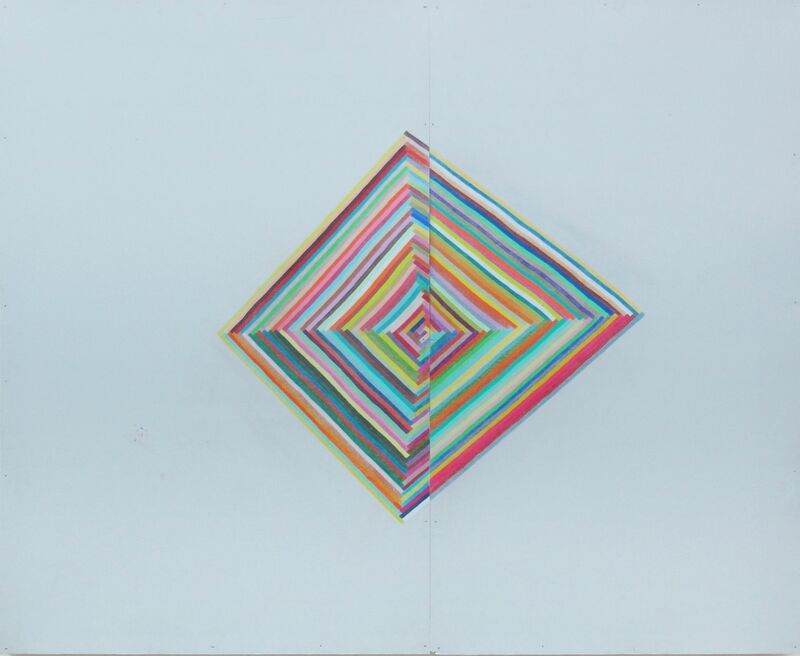 Roberta Smith for New York Times Review of Alicia McCarthy at Jack Hanley Gallery, 2015. Jerry Saltz for Vulture Review of Alicia McCarthy's Exhibition at Jack Hanley Gallery, 2015. Emily Hall for Artforum Review of Alicia McCarthy's Exhibition at Jack Hanley Gallery, 2015.